Nothing can beat the heat better than a big glass of delightful lemonade flavored with cucumber, lemon zest and fresh mint. 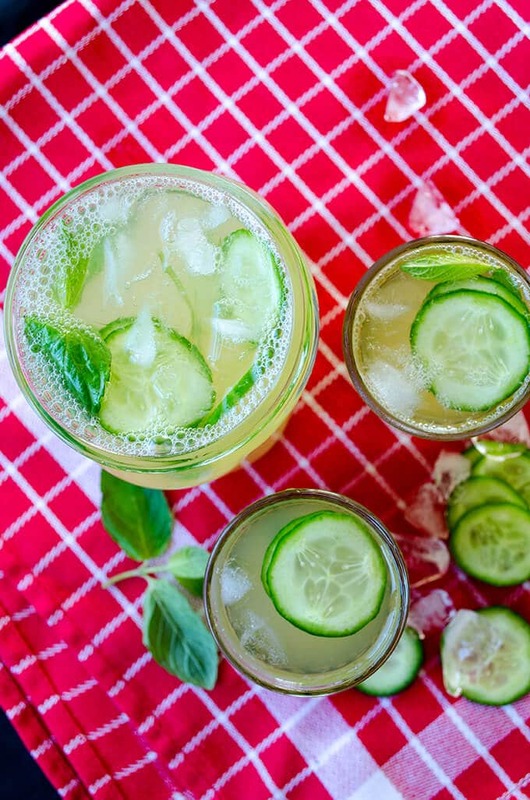 Don’t forget to add lots of ice cubes into this incredibly Fresh Cucumber Lemonade! Who doesn’t like lemonade on a boiling summer day? Do you make it yourself or just prefer something store bought? It might seem the easiest way, but definitely not the tastiest! Nothing could be better for refreshment than a big pitcher of Fresh Cucumber Lemonade because it is homemade and it contains the most refreshing foods of the season; cucumber, lemon and mint. They pair wonderfully to make this amazing yet easy beverage. If you’d love to have a dessert with your lemonade to double the joy, it has to be a slice of a light Lemon Magic Custard Cake. Lemonade is a classic favorite in Turkey just like in most Middle Eastern countries. I wanted to go a little further from the classic version, which is based on lemon and no other flavors. The most common flavor to pair with lemon in this summer drink is fresh mint. You can toss in a few sprigs of mint in your lemonade and that’s it. But why not try new flavors? I’ve tried ginger lemonade, strawberry lemonade and marjoram in a fresh homemade lemonade so far and they all made perfect combination! It’s time for cucumber now! The flavors in this cucumber lemonade are very well blended. I grated the cucumbers into a bowl and pounded the fresh mint sprigs using a mortar and a pestle. Then I combined them in a cheese cloth and squeezed their juice into a larger bowl. You will get a lovely green color at the end of this step. Then you combine this juice with a syrup made with lemon. I use 5 tablespoons sugar, but you can use more or less to your taste. 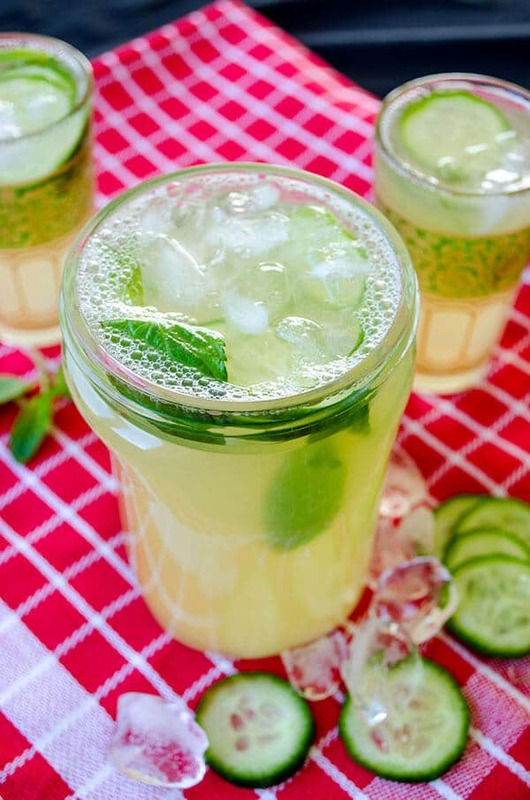 Cucumber lemonade is such a refreshing drink that you will be hooked once you try. I’m sure it will be your ultimate summer beverage. You can make it in large quantity, maybe overnight to chill it for long hours and relish the following day. A large glass of cucumber lemonade at breakfast will definitely zing-up your mornings! Can we call this a skinny drink? Yes if you leave the sugar out. Do you know what else you can use? A little salt makes it a delightlful salty drink. A delightful lemonade flavored with cucumber, lemon zest and fresh mint. Wash the cucumbers very well. Leave their skin on and grate them in a bowl. Pound the mint leaves and lemon zest in a mortar and toss in the bowl. Stir with a spoon and transfer them in a piece of cheese cloth. Squeeze the juice into the bowl. Set aside. You can use a blender instead, but the flavors stand out with this method. Mix sugar and lemon juice in hot water until sugar dissolves. Combine this syrup with cucumber juice flavored with lemon zest and mint. Chill it at least for an hour and serve with ice cubes, mint leaves and cucumber slices. is mint leaf optional?, is it necessary to use oregano leaves instead? Oregano would be a nice touch too. I just love the refreshing flavor of mint. That looks like the perfect summer drink! I’m definitely going to try this recipe! Definitely so refreshing! Hope you love it!